Depending where you live and the financial institution you use for banking, moving money on and off your online casino account can be a challenge. If you’re running into problems or looking for new banking options, Trustly might be able to help. You may know Trustly by its former name, Instabank. It’s been around since 2008 and it’s been used to make online casino deposits and withdrawals for years. It’s especially useful for people who don’t have or don’t want to use credit cards for online gaming transactions. According to its site, 1.7 million secure transactions are made using Trustly every month. In terms of the way it works, Trustly falls somewhere between traditional bank transfers and e-wallet services like Neteller and Skrill. Trustly facilitates direct transactions between your bank account and your online casino account. And since it doesn’t use a separate e-wallet account, it can save you time with less steps to process the transactions and fewer fees since you’re moving money from the casino to your bank and vice versa in just one step. Keep reading to learn more about how Trustly can help you make online gambling deposits and withdrawals, some of the advantages and disadvantages of using Trustly plus a closer look at the transaction times and fees you can expect. Trustly is currently available to customers in 29 European countries, including the United Kingdom. If you’re in the UK you can use Trustly if you bank with Lloyds Bank, Barclays, NatWest, Halifax, Santander, HSBC, Nationwide, Royal Bank of Scotland, The Co-operative Bank, Yorkshire Bank, Clydesdale Bank, Metro Bank or Ulster Bank and have online banking abilities. Trustly is accepted at tonnes of online casinos. The easiest way to find out is to visit the casino’s website and look for the page describing accepted deposit and withdrawal methods. All online casinos display this info prominently and it’s also available in the casino’s cashier area. If you’re having trouble finding it, reach out to the casino’s customer support team using email or the live chat tool and ask for help. 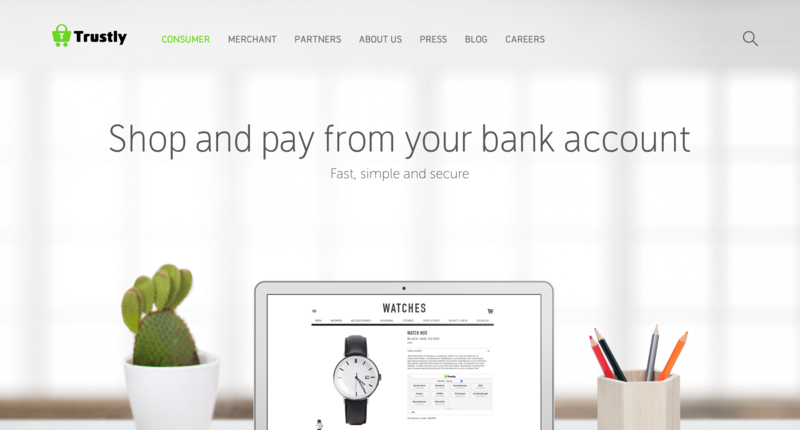 As we said, Trustly is a little different than e-wallet services like Neteller and Skrill. Trustly is not an e-wallet. Think of it as a third-party service that makes your bank deposit or withdrawal even more secure. Using Trustly is really easy and as long as your bank supports it, getting started is a breeze. Go to the casino’s cashier and find the tool for making deposits. Select Trustly as your deposit method and then choose your bank. It will prompt you to log in to your online banking and then choose which account you want to deposit from and how much money you want to deposit. You’ll have to provide whatever security or authentication information you normally use to log into your online banking system and then approve the Trustly transaction. In almost all cases, deposits using Trustly are instantaneous or close to it. So if everything works the way it’s supposed to the money will be in your account ready to bet with in moments. Withdrawals with Trustly work much the same way, just in reverse. Ideally you should always use the same banking method to withdraw as you used to deposit. So if you funded your account using Trustly, using it to make withdrawals will be really easy. Just go to your casino’s cashier and find the withdrawal tool. Select Trustly as your withdrawal method and enter the necessary banking information to complete the withdrawal. There are a few main reasons people choose Trustly to move their money online, especially in the context of online gambling. Trustly is basically an enhanced bank transfer but there are a few key ways Trustly is way better. No Credit Cards Needed – One huge plus is that you don’t need a credit card to use Trustly. Some people don’t have a credit card and others don’t feel comfortable using their credit cards to make deposits and withdrawals at online casinos. You also don’t need to install any software or even register for an additional account. All you need is a bank account at one of Trustly’s partner banks and the ability to do online banking. Extra Security – The money moves directly from your bank account to the casino, the same way it does with a traditional bank transfer, except it moves via a secure connection provided by Trustly. Think of Trustly as an extra layer of security between your bank account and the online casino. Trustly is designed to safeguard the transaction and your banking information. Faster Transactions – The amount of time it takes to process transactions is another way Trustly blows away traditional bank transfers. When you make deposits using Trustly they appear in your casino account immediately, compared to bank transfers that can take many days. The same is true for withdrawals. Lower Fees – It’s important to check with your specific bank and online casino for the exact fees they charge for transactions using Trustly but generally they’re lower than traditional bank transfers. Banks charge big fees for wire transfers so this is a great way to find some savings. Bank transfers are often used to move bigger sums of money and Trustly is favoured for the same reason. If you’re eligible for the service, don’t want to use a credit card and prefer shorter wait times and potentially lower fees for moving money to your online casino account, think about giving Trustly a shot. Trustly was started in Sweden in 2008 by founders Carl Wilson, Joel Jakobsson and Lukas Gratte as a financial technology company and first started making transactions the same year. In 2009 the company secured further investment and began developing a second version of their payment processing technology. In 2010 it continued growing and opened an office in Malta. The company’s revenues experienced rapid growth and after launching its new software in 2011 it sold a 25% stake to investment group Alfvén & Didrikson. In 2014 the company entered a strategic partnership with Paypal and Groupon and also completed its 10 millionth transaction. The same year the risk capital firm Bridgepoint Capital purchased a minority stake in the company for a reported €23 million. In 2015 Trustly processed more than €1.7 billion worth of online transactions, reaching an estimated 67 million customers in 29 European countries. The company employs roughly 135 employees working in offices in Sweden, Spain and Malta. Trustly is an accepted banking method at most major online casinos as long as you live in an accepted European country and have a bank account at one of Trustly’s partner banks. Check our comprehensive online casino reviews to see which sites accept Trustly.